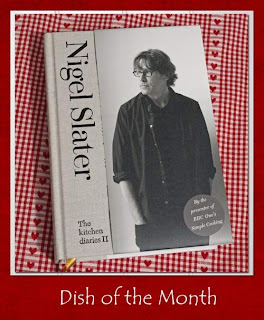 In the Kitchen Diaries II, Nigel Slater tells us " I am not a chef and never have been. I am a home cook who writes about food." He goes on to say "I'm neither slapdash or particularly pedantic in the kitchen (I haven't much time for uptight foodies; they seem to have so little fun). Neither am I someone who tries to dictate how something should be done and I am never happier than when a reader simply uses my recipe as an inspiration for their own." No matter, I've never failed to be inspired by Nigel's recipes and ideas, even if, sometimes, I veer so far off recipe for them to become unrecognisable! And so to this month's offering which is Lamb 'osso buco' with parsley papardelle. Guess what? I didn't have lamb steaks on the bone, I had a nice piece of Herdwick rolled shoulder, so I made this into more of a pot roast, oh and no Marsala either, so I used a tablespoon of Brandy and some lamb stock. And, because I haven't been feeling too well recently and couldn't face making roasties, I just threw the potatoes in to cook with it. So no need for pappardelle, although I may make that to eat with the left over lamb. I also made some fresh mint sauce which added to the deliciousness. Dessert could have been Pear and Chocolate Oat Crumble from KDII, but I didn't have any pears, so I concocted a Peach, Bramble and Almond Crumble instead. 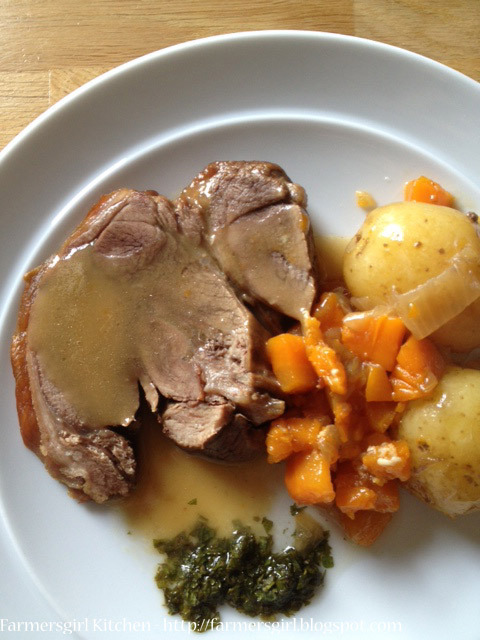 As this is my recipe rather than Nigel's, I have included it for you below:. 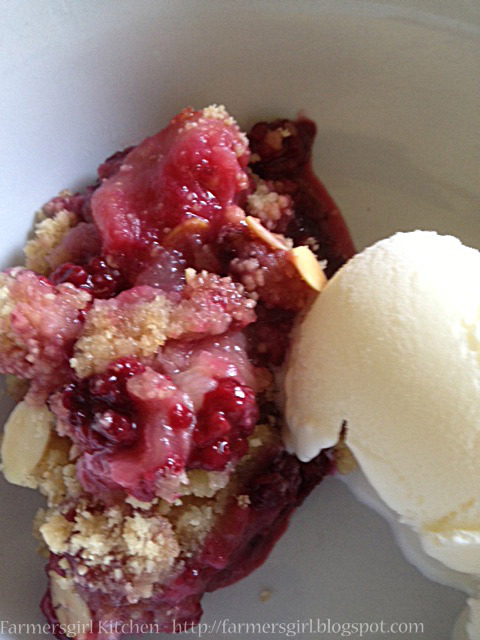 about a cup of blackberries (brambles) - or a couple of handfuls - sorry this is crumble not science! 1. Skin the peaches, by putting them in a bowl, pouring over boiling water and leaving for a couple of minutes, then removing and the skin should come off easily. 2. Slice the peaches and place in an ovenproof dish. Add the brambles, and the sugar. 3. Put the flour, ground almonds and butter, cut into cubes, into a bowl. Rub the butter through the flour and almond mixture until it resembles breadcrumbs. 4. Add the demerara sugar and spoon over the fruit in the ovenproof dish. 5. Sprinkle the flaked almonds over the crumble mixture. 6. Bake at 160C for about 40 minutes until the fruit is bubbling and the crumble has turned golden brown. 7. Serve with cream, ice cream, yogurt or custard. I love a bit of Nigel! I never seem to get round to taking part in blog challenges, but if I ever do, this one will definitely be on my list! I LOVE this Janice! 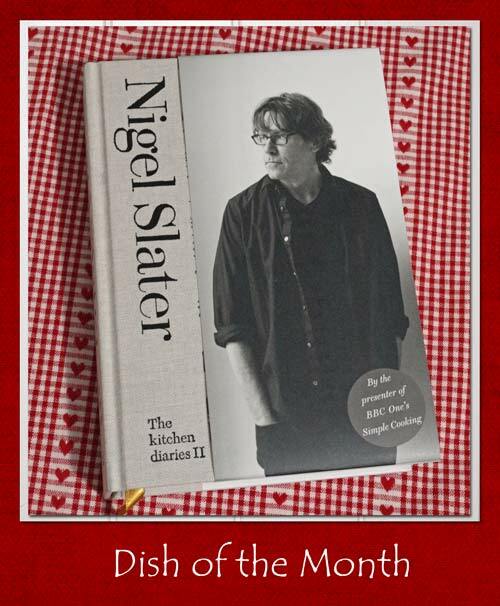 And I will try my hardest to cook along with Nigel again! Not that it's that hard! 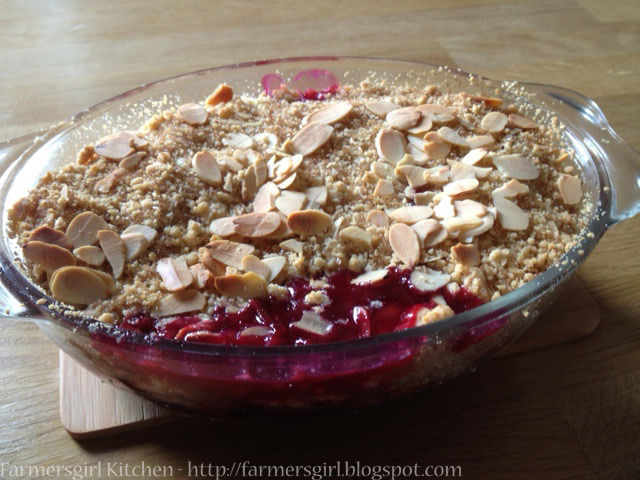 That crumble looks utterly lush! I have added my post to the linky.